The crate beneath my desk overfloweth with news clippings. It's time to clean house. Here are twelve news tidbits gleaned from various legit sources. These are offered sans Internet addresses because sometimes the address is longer than the tidbit. You'll just have to trust me. 1. If you absolutely feel the need to double check an item and you use your phone to do so, you may want to wash your hands afterwards. According to the Michigan School of Public Health, Americans check their phones about 47 times per day and a study found more than 17,000 germs on a typical phone, about ten times more bacteria than most toilet seats. 2. A Baylor University study found that women students spend an average of ten hours a day on their cellphones and men students spend an average of eight hours. Addiction like this is affecting the travel industry. Disney World reports that park guests colliding has become a serious problem. 3. Maybe those people are answering robocalls. According to YouMail, which tracks these, the number of robocalls is on the upswing. There were an estimated 3.4 billion in April, an increase of almost 900 million a month compared with a year ago. 4. School is almost out and just in time. Heat is an achievement sapper. This week a Harvard study revealed that hot temperatures adversely affect academic achievement. It found that an average temperature increase of one degree in a school year decreased the amount learned that year by one percent. 5. With the kidlings home for the summer, playing a board game might be fun. Just in time, Monopoly is debuting a new Cheaters Edition. They found that more than 50 percent of players cheat while playing. So, game designers have built 15 of the most popular cheats right into the new game (like moving the wrong number of spots on a dice roll, robbing money from the bank, and stealing another player’s hotel). 6. If you take the kidlings to the beach this summer go on a Tuesday. 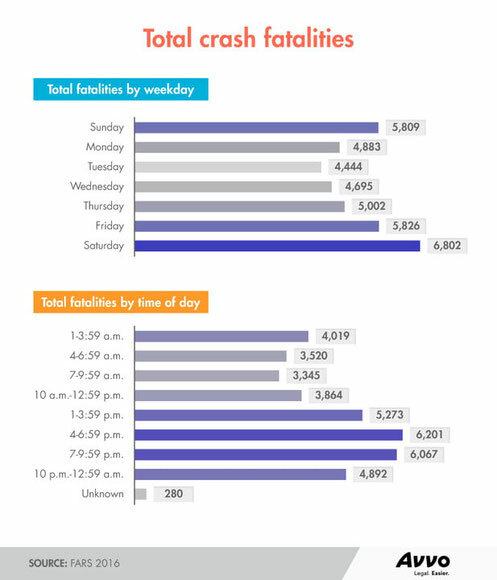 According to the National Highway Traffic Safety Administration, Saturday is the most dangerous day to drive, followed by Friday and then Sunday. Tuesday, the safest driving day of the week, is 53 percent safer than those weekend days. 7. Speaking of driving, the last country on earth that does not allow women to drive is Saudi Arabia. The government has just issued licenses to ten women and the driving ban for all women will be lifted on June 24. 8. You can't drive if your car won't start. If that's your situation maybe your car is infested with rats. This is a real problem. A class-action lawsuit was filed in 2016 in California against an automobile manufacturer claiming the company should cover damage from rodents chewing through insulation for wiring that is now soy-based versus petroleum-based. Some people have actually had their autos destroyed by hoards of hungry rats. 10. Staying cool is not a problem for dogs this time of year because they love to stick their heads out of car windows and feel the breeze. The key, however, is to make sure your dog is actually a dog. A family in China apparently did not do this. They got suspicious when their puppy started to grow and got to 250 pounds and began walking on its hind legs. Plus, it was eating two buckets of noodles every day. It turned out their “dog” was actually an Asiatic black bear. 11. On the sports front, you would probably guess that the most watched televised sport in England is soccer. You might be surprised by what is the second most watched sport – darts. The Professional Dart Corporation says the top “dartists” in England (and Europe) compete in major tournaments and can earn seven-figure salaries.